I will totally admit – as I did in my last post – that I never was on the ACTFL ‘proficiency’ bandwagon in class. Not that I didn’t get ‘proficiency’ but I didn’t get why I had to focus on the levels with my students. Nope, didn’t think it was necessary in my classroom. Every time it came up on #langchat as a discussion item I listened…but I didn’t buy in to using them with students. Why? Well I didn’t think it was that motivating. Really – I expected my students to care, to want to get to ‘Novice High’? I thought they’d react with all the enthusiasm of a request for them to complete 100 questions from a workbook. I mean – “Whoo hoo I’m Novice High!”. Couldn’t see it. I was wrong. I get it…I really do – after time spent at #tellcollab in Seattle, listening to Thomas Sauer and all the great teachers who were sharing, it suddenly clicked. 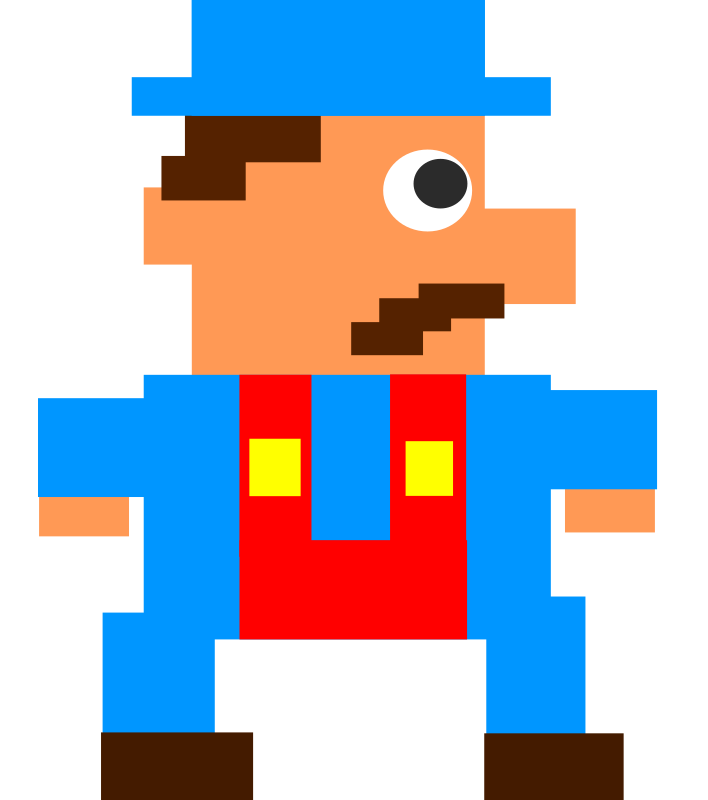 Specifically, when Alyssa Villarreal said “Kids don’t want easy – they aren’t afraid of ‘hard’…just look at video games…” the proverbial penny dropped. What do I mean by this? Consider that our kids play, and replay a game trying to get to the next ‘level’ for a new challenge, a new reward or a new option to play. They will play and replay a level trying to get enough points to move up. They will play solo and against each other. They will (as I do with Angry Birds!) seek out cheats on YouTube to help them accomplish tasks they can’t seem to get. And they will do it over and over again until they get there. 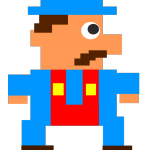 What I have been doing in class has been like asking students to play a video game without the reward of being able to ‘achieve’ those levels. You see, I’ve been big on meeting the expectations in my class. Students know, and can repeat ad nauseam, what it means to be meeting or fully meeting expectations in class. They know that ‘meeting’ means you are delivering the current unit items well and that ‘fully meeting’ means you are not only able to use the current items well but you are bringing in past learning effectively too. They can pre-mark work and point out where and how they do so. But that’s it. I see it now – I’ve been asking them to play the video game over and over but I have failed to validate this but giving them a ‘new level’ to achieve. I’ve been asking them to improve but not ‘rewarding them’ for achieving and giving them the next ‘level’ to shoot for. You know if you asked me to do the same thing over and over, but didn’t give me the satisfaction of achieving something beyond “you did that level well” I’d give up. If you didn’t clearly lay out not only where I was in the ‘game’ but what I would have to do to get to the next level (and provide tips/a path – okay the ‘cheats’ to do so), at some point I would ask myself why I was doing this? At some point I would give up trying to improve. At some point I’d stagnate in my learning. So thank you …thanks to Alyssa for that ‘nugget’ from her workshop, thanks to all the #langchat proficiency promoters who have shared ‘how they share’ with their classes. Thanks also to my fellow ‘rebel’ colleague Connie who, along with me, is starting to lead the ‘proficiency’ charge in my department because we know it is the right way to go. I get it…going to use them with my students…looking forward to seeing them more ‘in the game’…. Inspiration – Shelter the Vocabulary – Not the Grammar – the awesome Carol Gaab continued to build upon ideas that Amy Lenord has been sending my/our way (no Vocab lists) by pounding home the idea that we should be sheltering the vocabulary – not the way to express it that they need. Carol said to focus on high-frequency vocabulary and use an appropriate text to keep reintroducing those words to allow students to make connections. But – if they need the grammar to communicate – give it/use it. After all, who ever said to a 4 year old “sorry but you can’t learn/use that until next year and I’ve explained how to construct it!”? If they need it, can use it – let them have it! I’ve already taken this idea in a new unit with my Yr 1’s and concocted 3 mini-stories for my students to use in exploring their current unit – using a class character that we love to put into interesting situations. Inspiration – Throw Out the Vocabulary Quiz – When a room is packed out at 5:15 on a Saturday you know this is a hot topic. Sara-Elizabeth Cottrell (a #langchat moderator) challenged us to think about the usefulness of the traditional “Here’s a word now write it in the Target Language” quiz. Really – how many times has a kid been able to produce it on the Friday quiz but never really use it/learn it after that. It is, Sara-Elizabeth emphasized, the myriad of connections to a word that makes it meaningful and useful to us. Instead of asking for the word for black – give a more open question “what colour is a panda?” I tried this already with my Yr2’s on various town locations. I asked “where can you hang out with friends?” – and got responses that were meaningful to my students. I have a full post coming on my first experiments with this! Inspiration – Untextbooking – This was a recurrent theme in more than one presentation and, judging by the attendance, a movement that is growing. I even tweeted that I wouldn’t be investing in textbook futures if I had seen the enthusiasm in many rooms for this. Why? Those who advocated for it did not shy away from the fact that leaving the textbook can initially mean more ‘work’ for the teacher. But the benefits – flexibility, choice, relevance and more – seem to far outweigh what it takes to convert. I will admit that many of my units, and initial structures I taught, came from textbooks – but ‘untextbooking’ seems to be a way to go beyond someone else’s definition of ‘what a student should know. I’m getting there! Validation – Focus on Summative Learning – a fast paced presentation from Sam and Steve in Alpine SD in Utah. They snuck in a clip of comedian Gerry Dee’s show (who was a teacher) and his ‘marking system’ for good measure – loved the home-grown Canadian touch (honestly I dare you to watch the clip and not see a bit of yourself in it). What was the validation – that the key and the goal should be “can they do what I want them to be able to do?”. They score a lot but only grade the summatives. Their freedom to innovate in their middle school environment is enviable but there are definite take-aways for me. I note that this year there is most of my weight on the summative evaluations and not much weight on the formative – I liked their rationale – I’m on the right path. 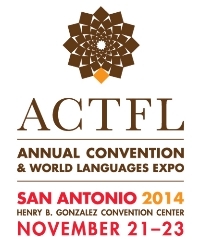 Finally I leave you with 2 of my other biggest lessons learned at ACTFL 2104. One – Comfortable shoes! You will walk and walk and walk – and run sometimes – to sessions to get into the room! Be prepared! Great shoes will be a necessity in your bid to make it to a workshop on time. The second lesson? Twitter rocks! I found people, shared ideas and learned about sessions I couldn’t attend all through the great tweeting of so many attendees. 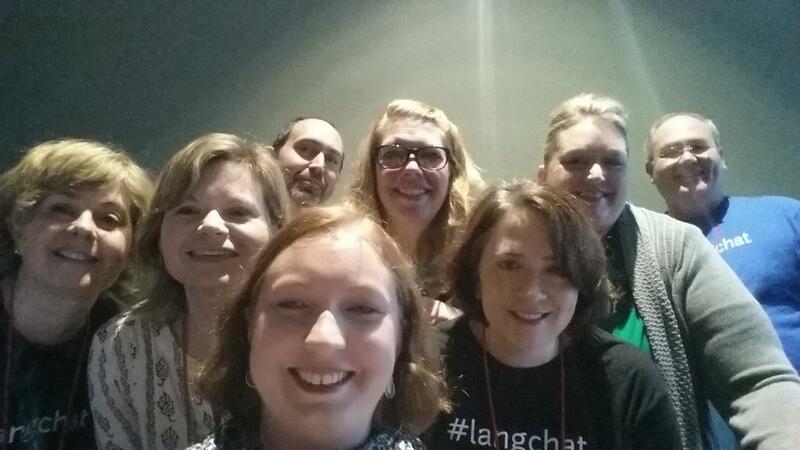 Many are part of the #langchat PLN (see above!). 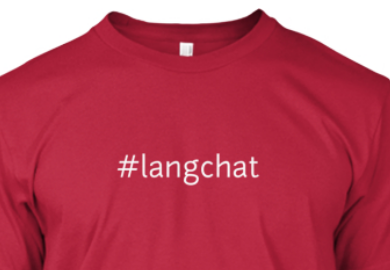 Twitter – get on it and get using the #langchat hashtag – you won’t regret it! I may not make San Diego (budgeting etc) but I am aiming for a return visit ASAP. 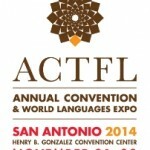 Thanks ACTFL! Okay – I’m excited and a little bit nervous. Why? 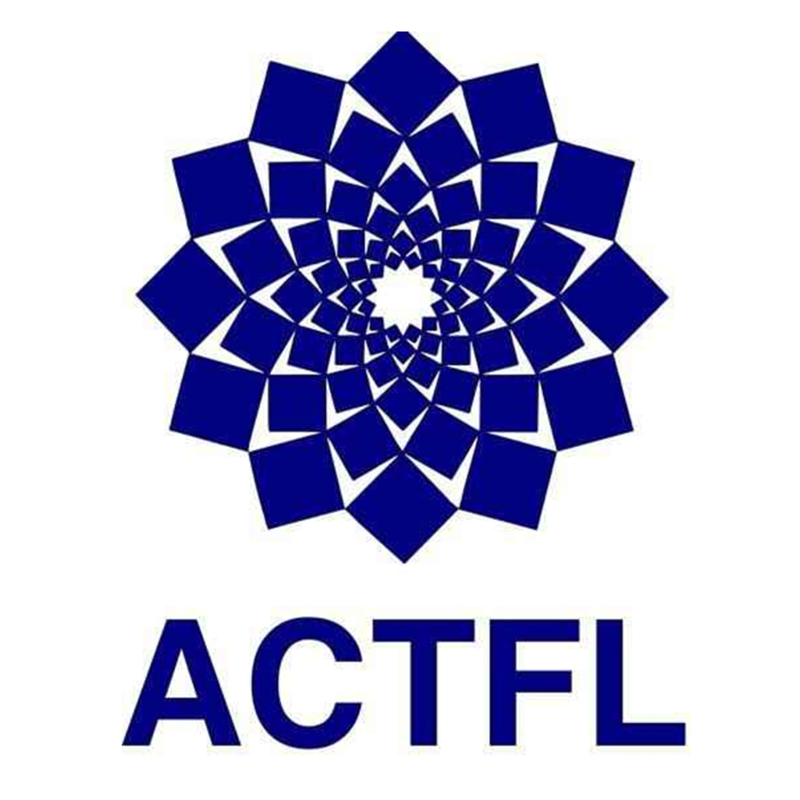 Well I’m off for my first big, really big, languages conference ACTFL 2014 (American Council on the Teachers of Foreign Languages) in San Antonio Texas. It’s the largest teaching conference I’ve ever attended, and my opportunity to hear and learn from some amazing teachers. Nervous also as I am helping to present the benefits of the #langchat PLN on Saturday (10am) to people who are interested in learning how Twitter can be a great source of Pro-D. I’m not nervous about presenting the information but I’m excited/nervous about the opportunity to meet my #langchat co-moderators in person. They are people who I look up to and respect but have never actually physically met before. What are they like in person? Are they taller than me or not? What do they sound like? Questions Questions! It’s going to be a lot of fun! Opportunity – I’m so excited to be able to attend workshops to learn. One of the thrills of a conference is to be able to hear and ask questions of someone who is doing something that you hope to one day be able to do. It’s the energy and the confidence of presenters that often help to carry me into a new way of thinking and doing. Information I get at any time but it’s the personal input, the stories and the ‘cheerleading’ that makes all the difference and a conference is a great way to charge the batteries! Advocacy – It’s no secret I am a big big #langchat fan. It has revolutionized my teaching and made me a way better teacher. I used to think I’d be content with a textbook, a workbook and some master copies – but nope, not any more. I’m making big changes in how I approach teaching, in small manageable ways, because of what I learn. The #langchat hashtag is my go-to for the latest ideas, problem sharing and food for thought. 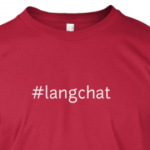 The #langchat chat is my go-to for diving into specific topics in a more detailed way. Both are essential to me as a professional. Connecting – This year I was so lucky to be able to take a Pro-D day and drive 1 1/2 hours south of Vancouver to visit with Catherine Ousellin in Mt. Vernon (@CatherineKU72). When the border agent asked me how I knew the person I was going to meet in the US I replied sheepishly “I met her online”. Ultimately I was allowed through and spent a morning with Catherine and her French classes – what a treat. There are many #langchat peeps who I will have the opportunity to meet in person – to actually speak to. They are the people who have supported me, laughed with me and provided me with inspiration and resources and more. I look forward to meeting them and thanking them – thanking them for being so willing to share and grow as part of the #langchat PLN! I’m even going to seek out Joe Dale, the first person I ever followed on Twitter and my first resource for technology ideas for the language classroom. 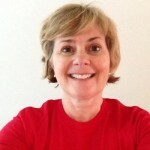 So look for me at the conference, I’ll be wearing my #langchat T (red or black) and hopefully will get to say hi. If you see me – please say “Hi” too. If you know of any teachers who are curious about what #langchat is, or how to follow the chat etc., come see us Saturday at 10am. If you are a #langchat regular watch for tweets about our ‘in person’ meetup on Thursday night. I look forward to reporting out what I’ve learned. See you in Texas y’all!